The Future is exciting! The 2019 #BalanceforBetter campaign runs all year long. It doesn't end on International Women's Day. The campaign theme provides a unified direction to guide continuous collective action, with activities reinforced and amplified all year. International Women’s Day 2019 is an opportunity to celebrate women in the EOS ecosystem but also an opportunity to commit to helping create a diverse, equal and inclusive EOS ecosystem for the future. 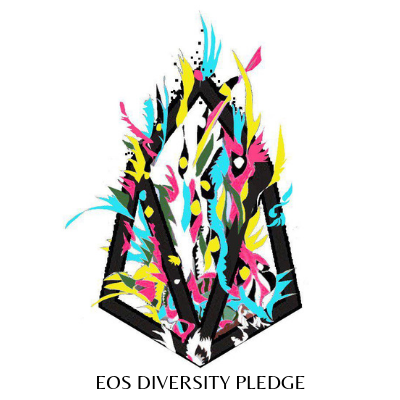 This will help us monitor progress in the EOS ecosystem and develop tools to increase diversity, equality and inclusion. Send 5 EOS to DIVERSITYEOS with the name of the person, or organization signing the manifesto. Tweet or share on (the landing page) on social media so the world can celebrate that you’ve signed the manifesto! Add the Diversity Manifesto badge and a link to the Diversity Manifesto to your website. We invite you to share your data on diversity, equality and inclusion which will be aggregated and anonymised. We are aware we are using the word diversity as shorthand for diversity, equality and inclusion. ✔ Equality is about fairness and eliminating barriers/discrimination. ✔ Diversity is about recognising and embracing difference. ✔ Inclusion is whether people feel included or excluded in interactions and processes. Diversity is not an end in itself, but a powerful means to collectively improve our work. By broadening the range of experiences and perspectives we bring to bear in our decision-making, we can ensure better decisions are made. It must also be felt and seen: in the actions we take, the language we use, the way we interact, the places we present ourselves and the ways in which we open ourselves up to challenge. In order to move forward, those of us who hold power must show through our actions and words that we are serious about delivering social good with people, and not to people. We must hold ourselves accountable for seeking out the voices too often ignored, to listen and respond, and in so doing, share our power with generosity and enthusiasm. We ask for your commitment and support to explore and understand equality, diversity and inclusion in EOS. In order to achieve the above we the undersigned have committed ourselves to the below, as a working charter to guide and drive us. It is our hope that you will join us. 3. We will commit to implementing an internal plan which seeks to improve diversity and inclusion within our organisation and address unconscious bias. There is no set form or required elements. It should just include concrete action and be fit for purpose for your organisation. 4. We will commit to diversity in our team at a staff and governance level. 5. We will commit to adopting an inclusive recruitment process, including a statement on equal opportunity and diversity when we advertise roles and taking steps to ensure that knowledge of vacancies reaches all areas of the community. 6. We will commit to only supporting events where there is an active and enforced diversity and inclusion policy and we will actively forgo industry events and conferences that employ objectification as entertainment. We will commit to put forward speakers from under-represented groups to represent our organisation. 7. We will commit to anonymously sharing our diversity data for an annual report on EOS diversity, equality and inclusion. How to Participate in the EOS Torch - #IWD19? To pass the EOS Torch 🔥 to another account you need to know its name. The owner of the NFT token usually asks the other user the name of their EOS account and sends the TORCH token. Remember that EOS allows the inclusion of a personal message in the transaction. When you pass the torch, make a short video of it or a photo and tag your favorite women. Around 10 seconds for video or so. Where would the proceeds of the campaign funds go to? The shEOS #balanceforbetter campaign will be distributed between these global NGOs: Campaign distributed between these NGOs: Mamahope and Empowermeos. Resources to help you take action. © 2019 Diverseeos, Happy #IWD19!